JUST GREAT! Now I have to spend the weekend cleaning my garage! Thanks a lot guys! On a side note. The Lotus has 9600 miles so far. The '02 Miata has 6600 miles on it. My wife doesn't drive much. 2002 Miata SE Titanium Gray, 6-speed, Bose 6-CD, Limited Slip (1 of 1491) 2007 CO Exige S, Track Pack, Touring Pack, Limited Slip, Traction Control, Star Shield - Useless Mirror Removed, Multivex Side Mirrors, Lotus Belt Pads, Sector111 Carbon Fiber Front Spoiler, Red Folding Front Tow Hook and Carpet Buttons, Chase Cam Mounts, JVC Everio 60GB HD Camcorder with Sunpak 37mm Wide Angle Lens and SanDisk 8GB MicroSD, 27% 3M Window Tint. Here's a shot from a recent oil change. 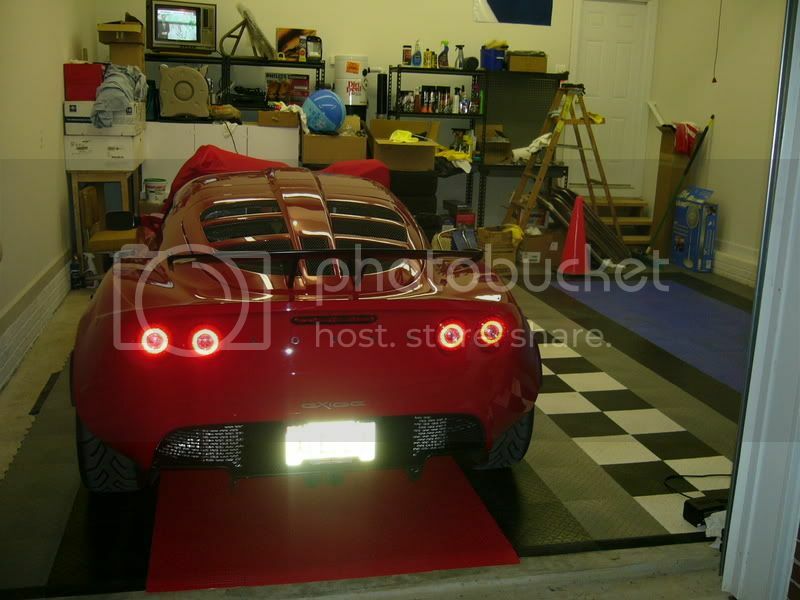 Here is the garage the my Lotus is stored in....and 2nd pic is whats right in front of the garage...I think I win! 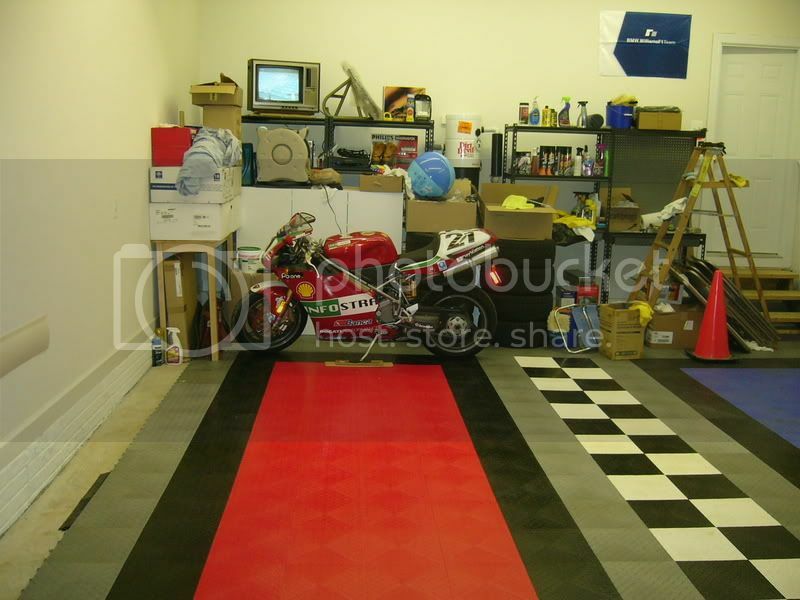 Smokey, this is exactly what I am trying to do in my garage!! How/who did you get your tracks to run the way they are on the lift side? any special equipment? Please PM me the info if you can. You mean the raised door tracks? I just had the garage door company come out and raise the door. They replaced the entire track assembly and replaced the door with a taller one (or maybe modified? didnt watch that part...but the new one has one extra slat). I think they charged $300 or something to do the job (they installed the original equipment, so they prob just core swapped it). 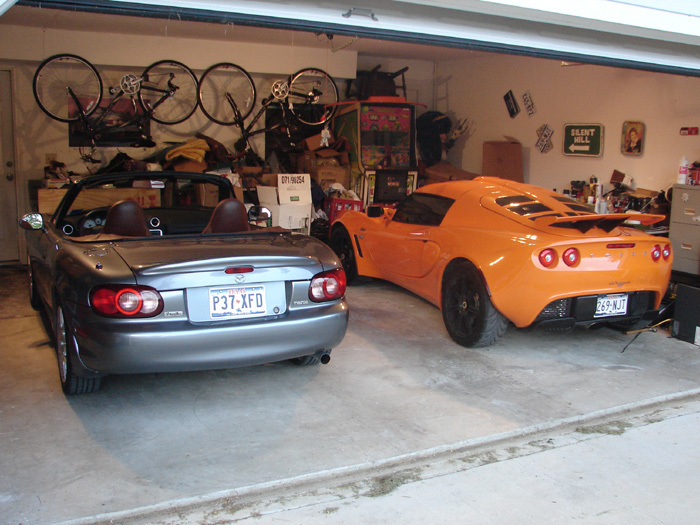 Here's a couple of my garage, taken while I was building my Lotus 7 clone. The small grey thing in the center of the frame is an evaporative cooler, which helps make the garage a little more tolerable in the summer months, although I've added a duct from the house's air conditioning system. On the right side, out of picture frame is another work bench, a good sized air compressor and some additional storage areas. Also on the right side of is a small shelf with a small TV connected to the local cable service, so I don't miss any of the action on Speed channel. 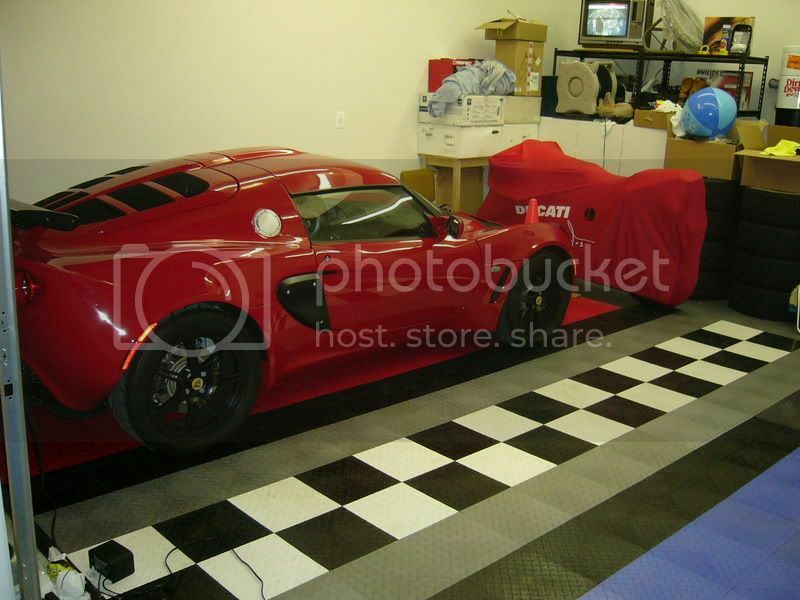 Out of frame on the left side is a large shelf unit which holds tires/wheels and large plastic storage boxes. 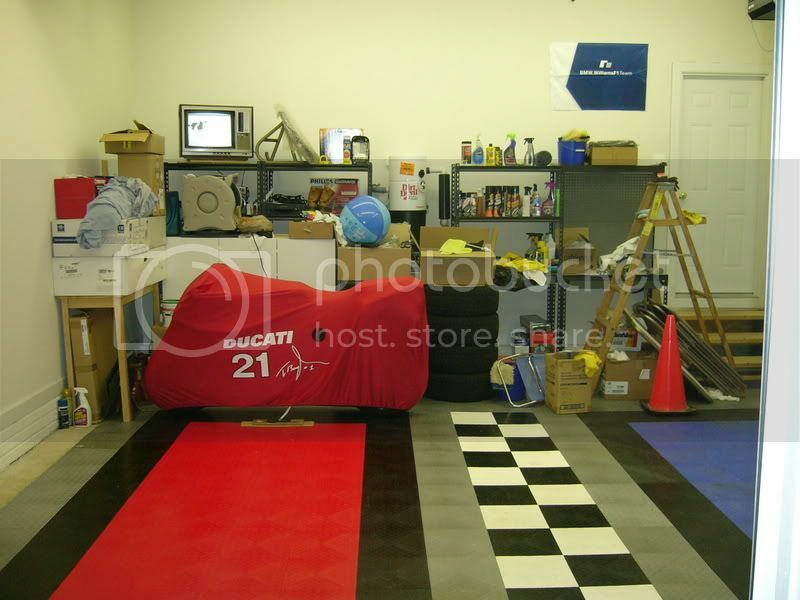 In addition to this area we also have a "normal" two car garage for the "regular" cars. I thought those coolers needed an exterior vent, but yours seems to have none. What model is that? 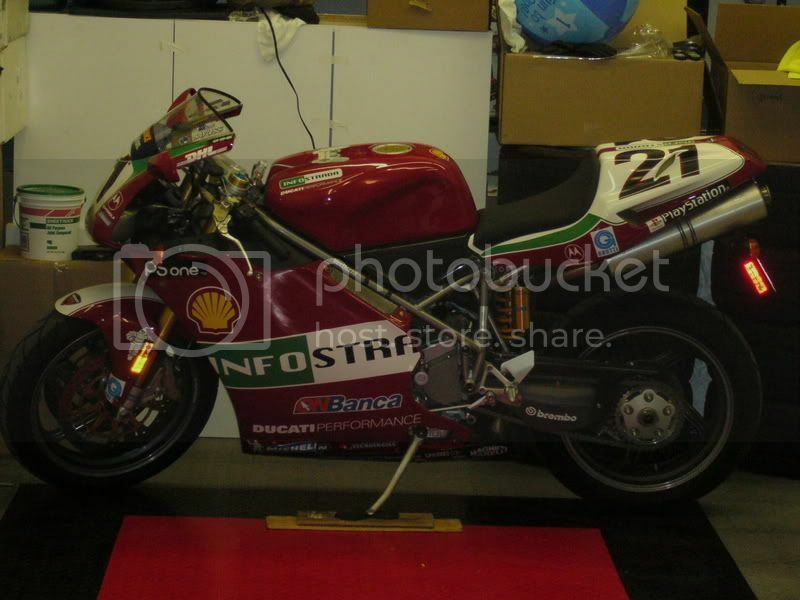 I'm real interested in getting something similar for the garage as well... very nice. Do you notice condensation buildup on the cars or any other surfaces from the cooler? Ya I've had a swamp cooler before...lived in Nex Mex for a few years. Thx for the links tho. Just thought maybe this was something that was more universal than the roof-mounted housing type units. PS: Atlanta isn't that dry either. Yep. What's that old saying? It's not the heat, it's the humidity! I've seen a few folks around here try to use swamp coolers with poor results. Evaporative cooling only works if the air is dry enough to readily take on additional moisture. Not happening around here during the summer months. I wonder...if I were to add a dehumidifier to the mix, if it could work. The evap or "swamp cooler" does its thing by adding moisture to the air, so they only work well when the air is really dry. For example, in the late Spring, early Summer in Arizona it's normal for the relative humidity to be in single digits, something around 7-9%. Once our "monsoon" season starts, normally about mid-July they become useless, just adding to the problem. No need to vent them outside, but they do require air flow, so when I use it I normally open the garage door, at least a bit. It's just a "band-aid" type of solution to the 100 degree weather. I did add a vent that feeds from one of the heat/AC ducts in the house which also helps a bit, but since there is no return duct for it the effect is very localized in one area. A buddy of mine, who also built a Stalker, punched a hole in the side wall of his garage and hung a fairly large window air conditioner in it, and it works quite well. The only problem, so far, is that he can't run the A/C and the welder at the same time. I failed to mention that while this is the one car side of the garage, it's a bit oversize at 13' x 23' so working on a 10' long car is a breeze (pun intended). If you live in the South and are trying to condition the space in your garage, you're only true option during the summer months is air conditioning. 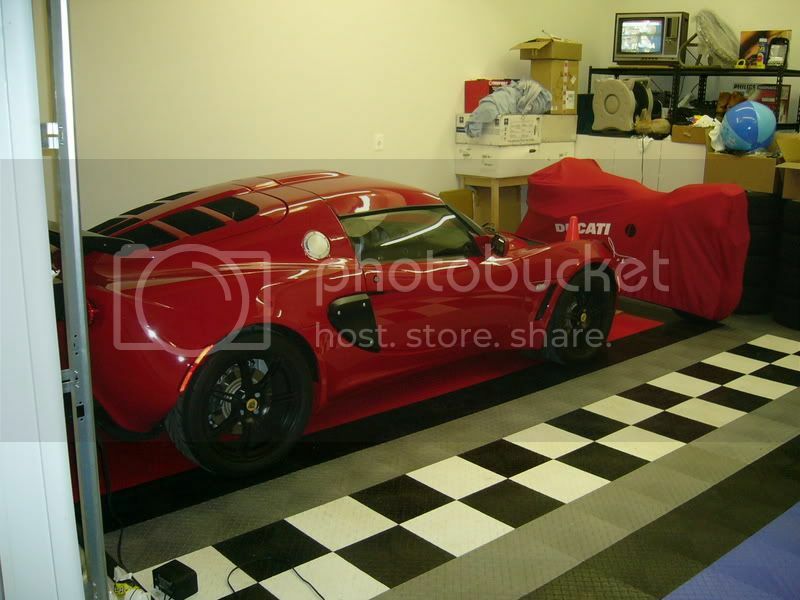 Is your garage insulated? If not, you may want to consider adding insulation, then use a window unit. They make some pretty good ones these days with decent SEER numbers. I use a dehumidifier in my basement garage, but it's already cool due to having only one wall exposed to outside temperatures. 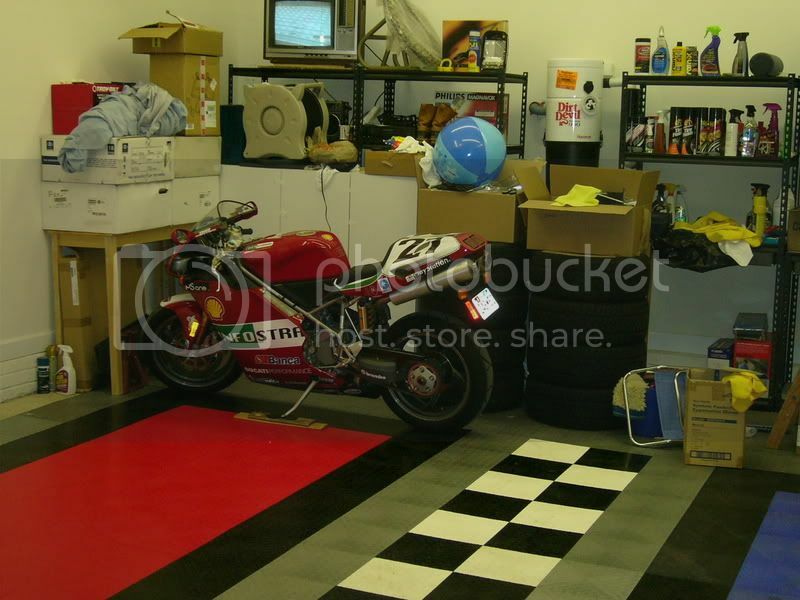 If your space is a typical garage with most or all of the walls (and roof) exposed to the outside, a dehumidifier won't do much good if you're trying to cool it off as well. 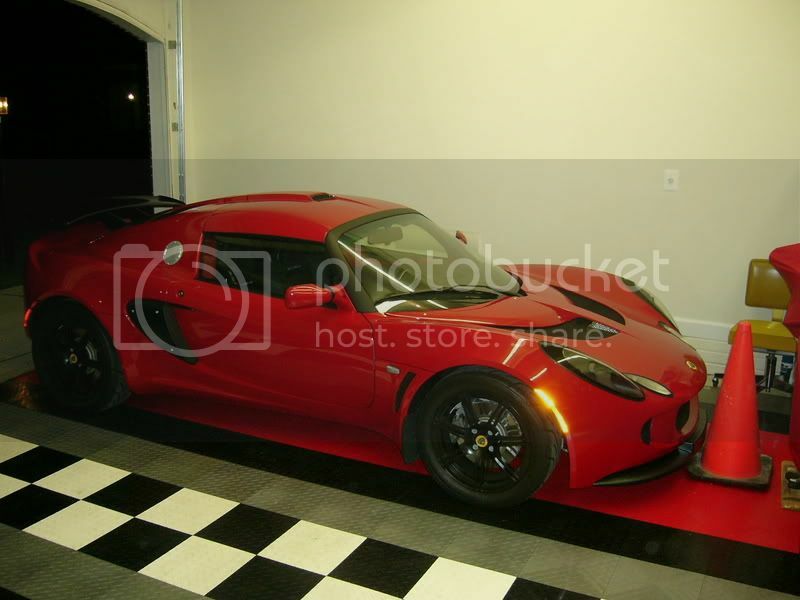 I don't have the problem of where to park the Ferrari and maybe I should get a lift for the Lotus because this is my garage of shame. Show yours with pride. You're prob right. However Only two walls are exposed to the exterior. And there is a room above which is air conditioned. The garage doors and walls are insulated as well. Works great in the winter, but man does it get hot in there during the summer. Not as bad as my last garage in Dallas, but still pretty hot. Maybe I should just plumb air from the upstairs room to divert to the garage, even more ideally I could manually/electrically divert with a switch (only when I need it). That would be neat. Prob punishing on the a/c unit though. Although it is the same size unit that cools half of our house, but is only being used for one room now. So maybe it would be ok. I'd want to seal the doors a little better, as there are some gaps at the bottom that would make that less efficient. Thx for the ideas guys. local600, that doesn't look so bad. the wheeled shelving can be moved around to give space when you need it. chances are that when you need something you already have it in your "vast overstocked warehouse"..
i don't see how some folks keep their shop so sterile clean and get anything done. i wish i could. i really need another 50 feet of wall space. 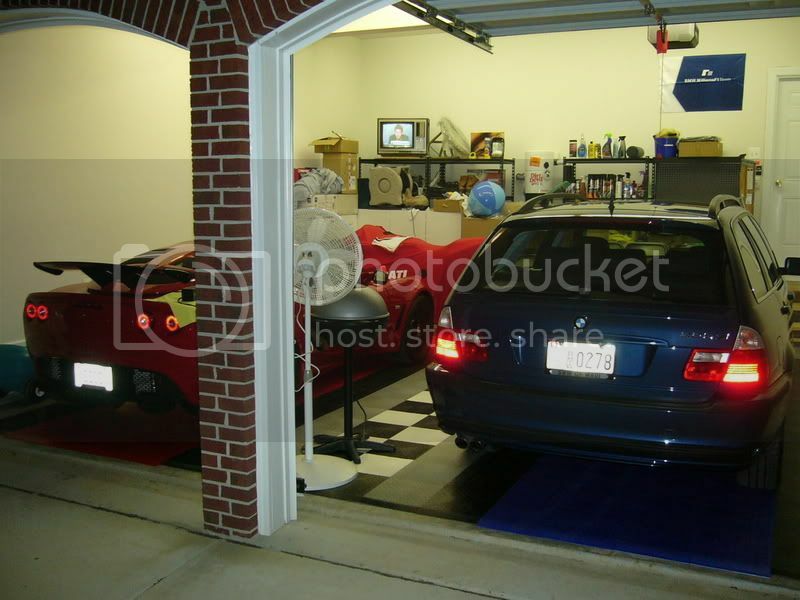 With the potential for fumes and such, you wouldn't really want to "share air" with your garage (supplies and returns) from the rest of your house. The best units I have seen, are the all in one through the wall units. Looks similiar to a window A/C, but is actually framed for and installed through the wall. You can get either just an A/C one or a reverse cycle unit that can be used to both heat and cool a space. 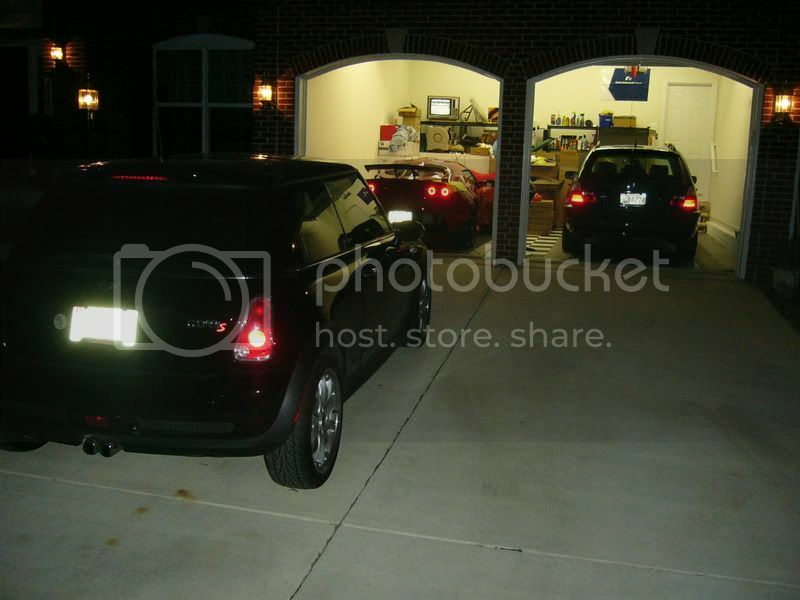 Would be neat to incorporate an external cut-out switch to cycle the unit off when the garage door was opened. Even better would be to have a timer so that it only cycled the unit off if the garage door was open for like 3 minutes of longer. This would keep the unit from being cycled off and on too much from just doing quick open and closes to pull in or out.